What Is a Fundraising Thermometer? Why Are Fundraising Thermometers Important? 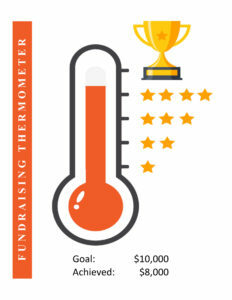 You've seen the fundraising thermometer before. It may have been a big, bold, red dial plastered on a billboard. It may have been a short green line splashed on your computer screen. It may have been a chart or a pie graph sent in an email. 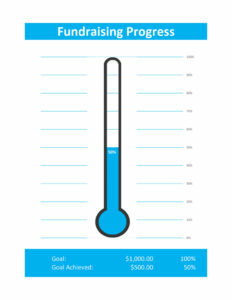 No matter the image used, fundraising thermometers are an excellent way to track progress towards a goal, and are a staple in the fundraising community. But why is that? What is it about fundraising thermometers that help companies raise more money? What compels fundraisers to constantly turn back to this tried-and-true fundraising marketing method? Let's look it at why it works, and how it can help your campaign raise more money. The fundraising thermometer takes on various forms. It's vital for us to really dig in and define what a fundraising thermometer is before we can even start to talk about why it's important. 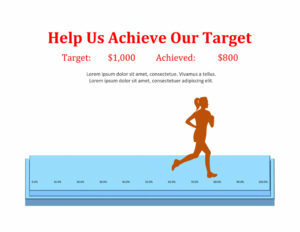 Fundraising thermometers are a visual representation of the progress an organization has made towards a goal. They can structure an entire campaign, measure progress on an individual level, or anything in between. It just depends on the needs and structure of your fundraiser. The central element of the fundraising thermometer isn't that it's a big red literal thermometer. 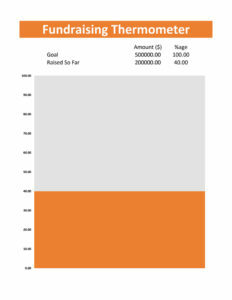 It's that it's some type of visual element that measures the progress of your fundraising goal. It gives your constituents an indication of your goal's overall progress. Fundraising thermometers work with all kinds of different fundraising campaigns. A visual representation of your organization's progress will help your organization achieve its goals in many ways. Fundraising thermometers really dig into the natural desire people have to feel impactful. People are much more likely to donate to a fundraising campaign when it's closer to its end-goal. A study out of Washington measured charitable contributions on the platform Kiva.org. They found that, as a campaign neared the end of its goal, people were significantly more likely to give. They saw a noticeable uptick at about 60%, and that number continued to increase until the goal was hit. For this reason, giving people an idea of your overall progress is tremendously important. But this raises an interesting, ethical question. Should you start with a smaller, more manageable goal and then shift your goalpost until you reach your desired overall fundraising goal? Cleverly managed, an organization could quickly reach 60% of a goal, and then shift their targets so that they were always at or above 60% of a constantly moving new “goal.” This method would take advantage of people's natural inclination to give more when a goal is closer to being met. The answer is that it's completely normal to change your targets, but, if you do it too often, it will seem disingenuous. A better idea would be to break your targets up somehow, for example, into hourly, daily, or weekly goals. That way, you can stress whichever of those numbers is closest to reaching its sub-goal, potentially increasing donations without lying to your donors. 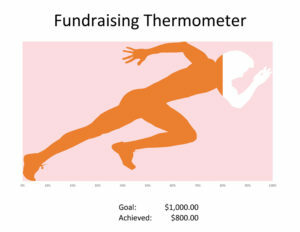 Fundraising thermometers act as a natural tracker for your fundraising campaign. This means that your campaign can rely on them to give you a visual reference for your campaign goals. Waking up in the morning and seeing that progress bar move forward gives people the power to push through another day. It's as much an internal tool as it is an external one. While effective communication, proper skill management, and adequate training are all important, at the end of the day, volunteers want to feel that they are working towards a tangible goal that can be reached. The Sports Recreation Alliance identified 6 properties that make up the average volunteer, one of which was Impact. Volunteers have a natural desire to feel like their progress is going to have an impact. It's crucial to keep your volunteers motivated. They fuel your campaign, are worth about $24 an hour on average, and they are twice as likely to actually contribute to your campaign. When people donate to a campaign, it's important to make them feel like they are donating to a cause that others stand behind. Katherine Grace Carman out of Harvard University conducted a study to measure the social influence on donation behavior. She found that people were significantly more likely to donate money if others were also donating. She considered it a form of societal peer pressure. Thermometers act as a gauge where constituents can see both their own and everyone else's contributions. Fundraising thermometers come in all shapes and sizes. 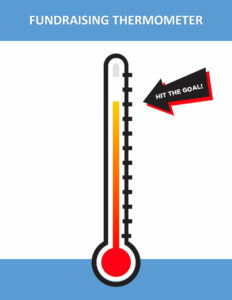 The important part of any fundraising thermometer isn't that it looks like a thermometer. It's that it tracks progress. It's also important to keep in mind the space in which the thermometer will go. In the internet age, digital thermometers are incredibly powerful, but old-fashioned, inked-in poster boards still have their place too. If your campaign is being run out on the streets or from an office or classroom, then you can't beat a traditional, printed thermometer. Simply print one out on a piece of paper, glue it to a posterboard (if you want), and grab a sharpie to color it in. We offer got a lot of cool, free thermometer templates for physical campaigns at the bottom of the page. for fundraisers, classroom activities, or to track goals. Life Size Cardboard Standup Goal Setting Thermometer. Well built and sturdy, this is a life-size stand-up 2D cardboard fundraising thermometer. Dry Erase Reusable Fundraiser Tracker. 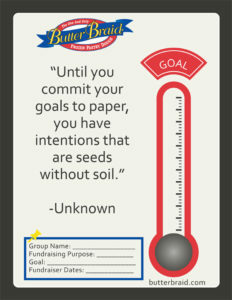 Fundraising thermometer goal setting chart adhesive decal. Easy to use, adheres well, smooth writing surface and very clean and bright. Websites like GoFundMe have a built-in digital thermometer, while social media is a great place to pop up a thermometer that you like. Of course, the strongest campaigns will include both digital and physical footprints. Being involved in the community – going door to door, hosting events, etc – is how you get local donations. But a digital presence can potentially reach millions of people. Having a thematic thermometer isn't only easier-on-the-eyes; it helps to remind people why they're donating in the first place. When printing a physical thermometer, use the highest quality paper and ink that you can. Splurging for better paper for you home printer is a good idea, but also consider going to a quality print shop. It can make a huge difference. 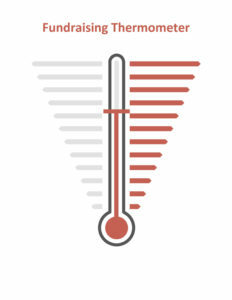 Make sure you are keeping track of all of your donation pathways, and that they're all syncing up to your thermometer. This goes for both online (digital) and offline (physical) thermometers. Make sure you are keeping track of text, digital, physical, mail, email, and any other donation pathway. Remember, you want to try to fill that donation meter as fast as possible, so keeping track of all donations is crucial. If you're sending out alerts, make sure to include a digital thermometer in the alerts (whether they're email or text). Did you know that the Concord Leadership Group showed that the average text-to-give donation is over $100? For email, M+Rs yearly non-profit update shows that email accounts for around 1/3 of all charitable donations. Make sure you send out reminders. Any time you pop up a physical or digital fundraising thermometer, make sure to let people know where the money is going. People want to know exactly what they're donating to. Tip: Do you know why those charity change jars that you see plastered in gas stations focus on an individual instead of the whole cause? It's called the identifiable victim effect. People are more likely to give to an identifiable individual that represents your cause than they are to give when they're shown facts or statistics. Deborah Small out of Stanford Business has a great study showing just that. Social media is a massive driver of publicity in the modern age. Younger people spend more time on Facebook and Instagram than any other website. Make sure that you take advantage of that with a sharable action next to your thermometer. Consider plastering the names of donors next to the thermometer. It makes people feel included. In his book How to Write Successful Fundraising Letters, Mal Warwick talks a lot about appealing to a donor's sense of ego. Donors want to see recognition – tangible or intangible. Donor rolls are a great way to appeal to this sense of ego without the necessity for physical gifts. What Happens if I Hit My Goal Early? If you're following our advice, and you have a good cause behind you, you may find yourself busting through your original donation goal. Which is amazing! That being said, what do you do about that filled up thermometer? You move your goal forward! It's perfectly normal to continue on if your campaign is at full steam. Wikipedia, NPR, the Red Cross, and many other major charity organizations shift their goals according to the success of their campaigns. Just make sure you aren't doing it every five minutes. If you feel like your fundraiser is getting crazy successful make a big jump instead of a small one when you increase your goalpost. Do I Need to Use a Digital Thermometer if I Use a Crowdfunding Website Like GoFundMe? Today, we are seeing more and more people turn towards websites like GoFundMe to fuel their overall fundraising goals. GoFundMe is a fantastic resource, and certainly something that can help you out on your journey. But, where do fundraising thermometers fit into the overall architecture of GoFundMe? GoFundMe has a built-in fundraising thermometer that's simple, attractive, and sleek. However, you should be linking back to your charity's website in the description, and your website should definitely have a fundraising thermometer somewhere in it. You won't need to create a digital thermometer on your GoFundMe page (it's built in), but you should still create a digital thermometer for your website that the page links to. What if I Can't Find a Fundraising Thermometer That Fits the Theme I'm Going For? If you can't find a perfect fit, find something close. Or, better yet, stick with something simple and clean, like a green line or classic red thermometer. Now that we've talked about what a fundraising thermometer is and why you need one, it's about time we got to the good stuff – free thermometers. 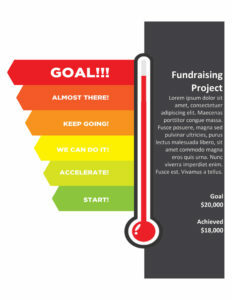 We put up some awesome free fundraising thermometer templates for you to take advantage of. So, next time you run a fundraiser, feel free to use one to give your fundraiser a boost. Selling baked goods — pies, cakes, pastries, even pizzas — is a common source of funds. So why not set up an empty pie pan as your thermometer? Place your goal at the top of the pie, and have each slice denote a certain dollar amount. You can use it as a selling tool: “if you buy four pizzas, we get another slice added to our pie.” You'll have that whole pie before you know it! The first step in this one is to concoct a phrased based on your fundraising cause. If, for instance, you are raising money for breast cancer research, the phrase could be: “Please help us raise money to help prevent and cure breast cancer.” From there, you divide your goal amount by the number of characters in the phrase; each letter costs that amount. To make things even more interesting, you can keep the phrase a secret, and have the members of your organization buy various letters to solve the puzzle. It will be your own personal Wheel of Fortune! It is particularly helpful to create a longer phrase for this kind of thermometer. This way, the dollar amount for each letter is lower. It is always advisable to break down a large goal into small bits, as to make the smaller goals more attainable (like setting long-term and short-term goals). 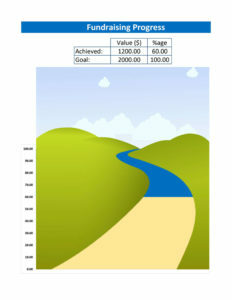 If your group is raising funds for travel expenses, creating a road map is the perfect way to track your progress. The simplest way is to draw dots at your starting and ending point, and color in as you accumulate money. Taking this further, you can make a model car or plane to move along as funds grow. A perfect fundraising thermometer for sports teams is to use a picture of empty grandstands. When you raise X dollars, paste a person into a seat. This can be fun for your organization, as they can either draw the people to paste into the stands, or use pictures of friends and family. Keep it up, and soon the stands will be filled with fans waiting to cheer on their favorite team. 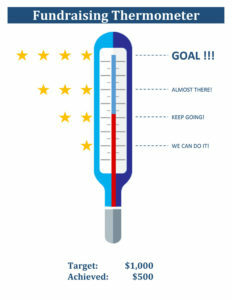 This fundraising thermometer works best in an online forum, since the requires alterations to an image. The idea is to have a small boy standing on line for a carnival ride, but is far shorter than the minimum height requirement. As funds pour in, the boy gets taller and taller, until he's finally tall enough to ride. This is particularly useful if your organization is selling tickets to an entertainment event. A common fundraising thermometer during the holiday season is a Christmas tree. In a similar fashion to the picture-building thermometer, this usually comprises an outline of a Christmas tree, with portions being colored in and the star representing the goal. That's all fine and good, but why not take it a step further? You can set up a very dynamic way of tracking your fundraising progress by using an actual Christmas tree. You and your organization can string it up with lights, but without the bulbs in place (make sure the lights aren't in series, or this won't work). When you reach one of your intermittent goals, screw in a light bulb. Once you've reached your goal, plug in the star. In essence, a traditional fundraising thermometer is just building a picture; for each dollar you earn, a bit of the picture is filled in. Why not make your thermometer more cause-specific? If, for instance, you are raising money for an addition to your church, draw an outline of the entire church, including the addition. As you make progress, fill in the outline for the new section. Once you're complete, fill in the entire church to signify that the building is whole and that you have succeeded in your efforts. While the term fundraising implies money, sometimes a campaign can be as simple as a canned food drive. Even so, you still want to track your progress. A fun and easy way to accomplish this is to use Andy Warhol's Campbell's Soup Can paintings as your thermometer. If your goal is to collect 500 cans of food, you can make each painted can represent five collected cans. Boy, will that canvas look full once you've succeeded! Another idea for a sports fundraising thermometer is to post fake standings, with your team at the bottom. Ahead of them will be their most heated rivals, each with a dollar amount assigned to them. Once you reach a team's value, you move ahead of them. Not only will this track your progress, but it will serve as motivation to raise more money. After all, you can't let Valley sit atop the standings for long! We've mentioned that setting intermittent goals and determining what can be accomplished with those funds is a good way to motivate your organization. But what if they had to work to reveal what those funds can get them? After each milestone is achieved, the dollar amount can be replaced by what it can bring the organization. So not only is everyone working to achieve the main goal, but they're also plugging away to reveal what's next.